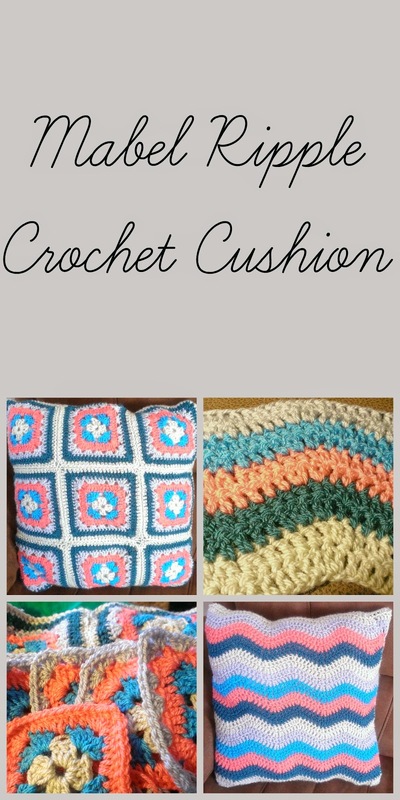 After finishing BG’s epic granny blanket I decided I needed a few quick projects. BG wanted a rainbow scarf so I had a search on the internet and found the perfect pattern on The Green Dragonfly. 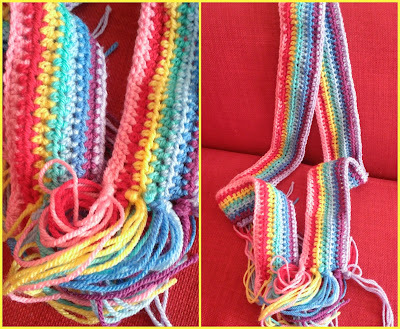 I used the yarn I had left over from the blanket to make BG’s. 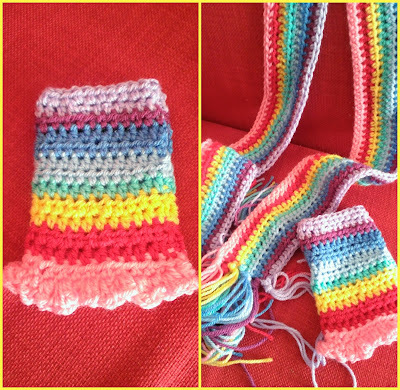 I learnt a new stitch the half treble crochet which is actually really easy. I made it slightly longer than the original pattern and started with 200 chains. I am rather pleased with it. The colours look amazing and it took about 6 hours to make. 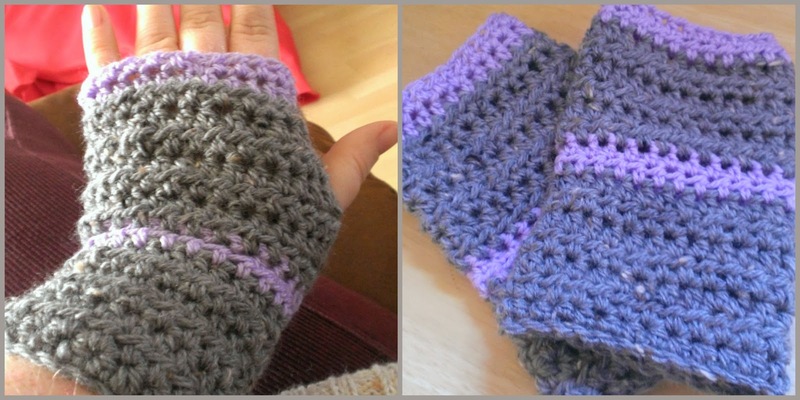 There is also a fingerless mitt pattern to go with them so I made those as well. Well I have made one good one and one that is far too tight so I have to do that again but they take about an hour to make. I learnt how to do a picot edging though I am not convinced mine is right. I am supposed to be giving them to her for her birthday at the end of November but I may give them to her sooner. Armed with my new crochet stitch and some Aran yarn I got at Aldi. Yes Aldi! I made OH a scarf as an anniversary gift which is soon. I forgot to count the chains but it’s about 200 the I did 12 rows of treble crochet in Aran, 2 rows in Stylecraft Special DK Lipstick (red) and then a final 2 rows of the Aran. OH wanted a bit of colour in it. It’s really long and he loves it! I decided I really needed to make something for myself so yesterday I made a pair of wrist warmers. I needed something for when I am out with the pushchair but get too hot in gloves. I made the pattern up as I went along. My fist wrist warmer was far too big so I am going to make it into a bag. I did a starting chain of 23 and then I forgot to write not how many rows. I just kept going until it was the right length. Use safety pins to help me work out where the thumb hole should go. I used the same Aran as before it was £7.99 for 400g so I have plenty left for other projects (family be warned scarves are coming your way) I added a few rows of Stylecraft Special DK Wisteria. They fit just right. I have a few birthday gifts to make and I am also going to make BG her advent this year. I have seen a simple pattern for drawstring bags so I will make 24 of them in different colours and then I need to work out how I am going to string them up. I figure if I make every day in November for 24 days then that will give me enough time to connect them together.